Joy here. 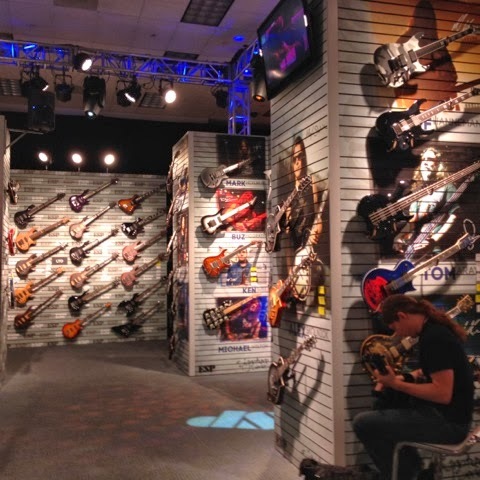 The last day of NAMM was a sad one for me, despite the 5-day hustle and the numb feet. By the time I arrived late afternoon, vendors had already started packing up. My first stop was Moog where I picked up a free water bottle to start my trek. I have fond memories of the Moog booth, having won two tickets to Moogfest on Thursday via a free chocolate bar I picked up because I was starving. 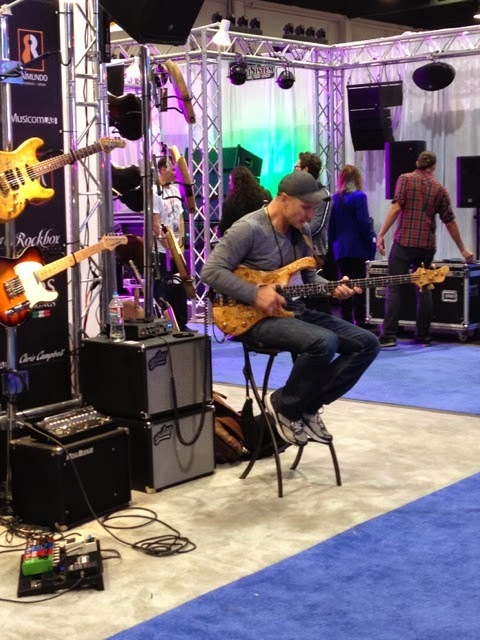 Thus fortified, I followed my ears to Mayones Guitars drawn in by the sharp snap of some serious slap bass. It turned out to be Wojtek Pilichoswki giving his signature axe a serious workout. I couldn’t leave. I wasn’t the only one, judging by the crowd that collected around me. Depending on the wielder, the bass is usually my favorite instrument in any band. Pilichowski had me enthralled. He inspired me to pick up my bass again and want to learn. Having no particular agenda, I wandered until I was stopped by another incredible display of bass mastery. Yolanda Charles and friends had taken over Elixir Strings and were having a serious jam session. There was another bassist along with Yolanda. Talk about jazz bass heaven. Along the way, I passed by my favorite vendors. Some of them were giving away merch for free. For others, sales were strong. A lot of good deals went down, apparent from the parade of newly bought instruments and equipment that crossed my path every few minutes. Lines were long at the Fender swag booth, everything was half off, Orange Amps were randomly giving away Slipknot masks and almost everyone was out of eco-bags. I’d given myself a different mission every day of NAMM: Friday was collecting eco-bags, Saturday was stickers. Sunday, I was on a Beatles hunt. I had read an article the night before (from a Vintage Guitar Magazine I’d picked up at the NAMM newsstand) about the guitars they used on their first appearance on the Ed Sullivan show. So I went off in search for them. 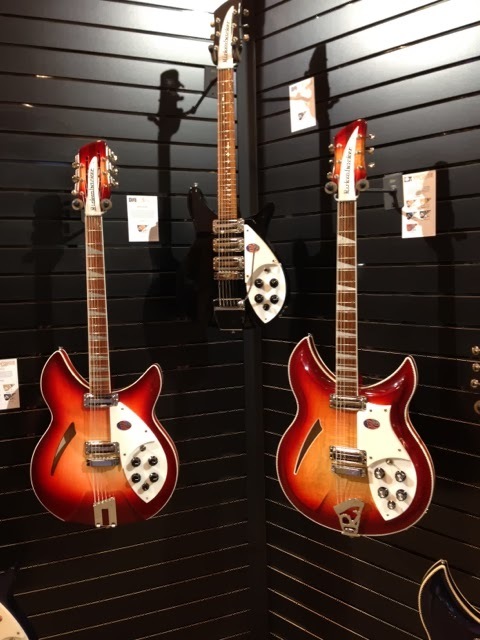 Paul McCartney’s violin bass by Höfner was nowhere to be found but I did see a semblance of John Lennon’s at Rickenbacker and a hint of George Harrison’s beloved Gretsch. Now it was almost closing time so I rushed to hit a few places. One of those, was Gibson. I’m not usually a fan but fell instantly in love with the Union Jack hanging on the wall. 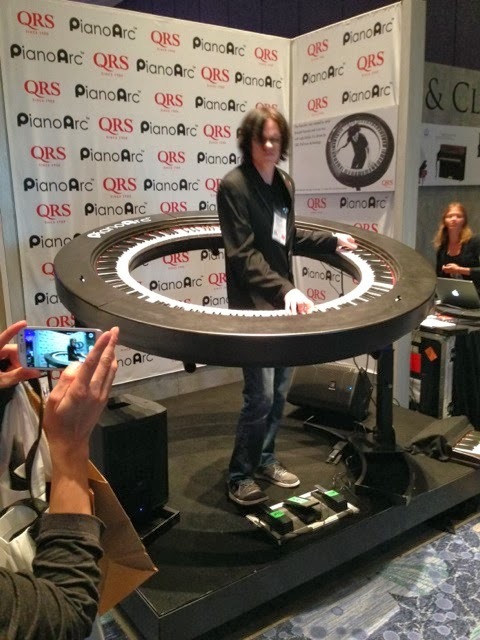 I also realized I hadn’t made it to Lounge 88 (the piano room) where things were still swinging with Brockett Parsons rockin’ the crazy PianoArc display.